Ever since coffee was discovered, people have been trying to come up with new and exciting ways to make it. In recent years, electronic coffee makers have become the norm in homes and offices. The range of functions and convenience make them extremely popular. While most people are content with the convenient electronic coffee makers, many coffee aficionados wonder, “Are there any other options?” Well, there have been several manual coffee makers invented that are still common today. Two of the most popular analog coffee makers are the Moka Pot and the French press. Now, most people know what a French press is. However, you may be asking, “What the heck is a Moka Pot?” So, to shed some light on this, we will lead off with the Moka Pot. A Moka pot is a coffee maker that was invented in (where else) Italy. 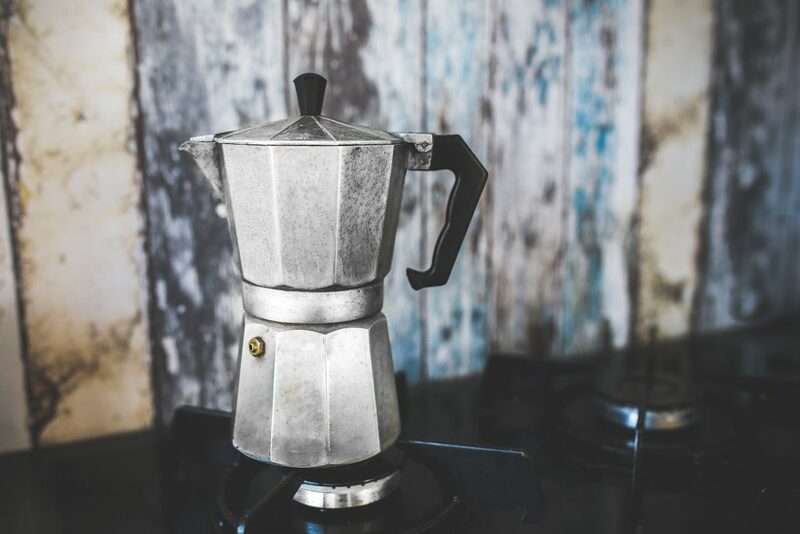 The man who invented the Moka pot was named Luigi De Ponti. Oddly enough, it was named after a city in Yemen named Mocha. The city of Mocha was actually a major hub of transportation in the coffee business. The Moka pot gained popularity in the 1930s in Europe when Alfonso Bialetti patented it. Today the Moka pot is most popular in Latin American and European countries. So why would you use a Moka Pot instead of a regular coffee maker? Well, the Moka pot has several characteristics that make it unique. To discuss these differences, first, you need to know how the Moka pot works. The Moka pot actually makes coffee that is a lot stronger than regular coffee. It is not quite espresso strong, but it is still very robust. One of the most surprising things about the Moka Pot is its simplicity. To use a Moka Pot, all you need is some water, grounds, and a stove. The design of the Moka pot is similar to a pressure cooker. Basically, the Moka pot is divided into two sections. The lower section contains the water. The top section has a funnel for the grounds, and the rest is the carafe for the finished product. The whole key to the Moka Pot’s coffee making ability is pressure. When you heat the water up, it builds pressure in the bottom of the pot. This is then forced through the funnel where the grounds are, resulting in more flavor extraction. This process is similar to making espresso and is why the coffee’s flavor is so bold. Be careful when brewing, to not overheat the water. Boiling the water can cause the coffee to have a burnt taste. Since the coffee from a Moka pot is stronger than normal coffee, the serving size is usually around 2 ounces. This size is known as demitasse. While this may not seem like much, the flavor far outstrips the serving size. So, the Moka Pot is a unique machine that uses simple pressure to create bold coffee. Now, let’s take a look at the more mainstream but no less ingenious device: the French press. Unlike the Moka Pot, the origins of the French press are less clear. The exact time the French press was invented is unknown. We do know that a Milanese (Italian) man named Attilio Calimani officially patented a design in 1929. So it’s called the French press, but it was an Italian who officially created it. Weird. Today, the French press’s use is widespread in the United States, Europe, and around the world. While the coffee it makes is not as strong as the Moka Pot, it is still quite delicious. There are several brands that make French press machines, but there are 3 basic elements. There is the beaker, the plunger, and the filter. The name French press actually gives a bit of a clue as to how it works. Basically, you mix hot water and coarsely ground coffee into the beaker. After letting it steep like you would tea, you use the plunger to press the grounds to the bottom of the beaker. This leaves you with fresh, flavorful coffee. The filter attached to the plunger keeps the grounds from rising with the finished coffee. With a French press, the coffee’s strength is similar to a drip brew. Correspondingly, the serving size is about the same. However, the flavor that you get from a French press is richer than drip brew coffee. This is because you typically use coarse ground beans, which have more flavorful oils left inside them than normal grounds. Similarities, Differences, and which is Better? While both the Moka Pot and French press are old school coffee makers that don’t need electricity, the similarities end there. The Moka pot is basically a pressure cooker for coffee that creates a little brother to espresso. In contrast, the French press uses the principles of making tea to create a richer type of regular coffee. Electronic coffee makers are all well and good. The convenience of just pushing a button and going about your day can be very beneficial. However, for the coffee lover who wants something simpler, both the Moka Pot and French press are very good alternatives. For those who want their socks knocked off by how strong their coffee is, the Moka Pot is the obvious choice. For those who want coffee that is more flavorful and doesn’t need a big machine, the French press is the way to go.